This is a very spacious independant 5 bedroom villa, with large gardens and pool. The ground floor consists of open plan lounge, dining area and kitchen, with 2 bedrooms 1 bathroom leading from the main entrance hall. Kitchen : Fully fitted in chrome and dark wood. Oven,Hob,Microwave, Dishwasher, domestic electrical items, large fridge freezer. Dining Area : Extendable dining table seats 10 people. 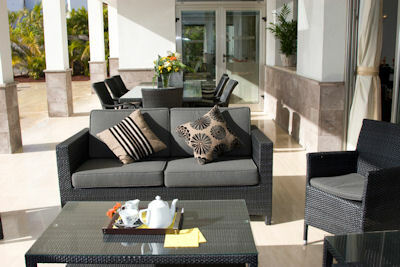 Lounge : Two large sofas, seats 4 each, with seperate chair and stools . Air conditioning unit. Large flat screen television, Blueray Dvd Player. BBC 1 & 2 ITV Channel 4 & 5. On the Sky digibox you have free to air channels and the option to bring your Sky card from the U.K to receive more programms. From the lounge is a large patio with sofas, chairs,another outside dining table and a BBQ. Bathroom : large bathroom with bath and sepaerate shower, 2 sinks, toilet and bidet. Bedroom No 1: King size bed, bedside cabinets, fitted wardrobes, chest of drawers, and a chair. Patio doors giving access to the garden. Bedroom 2: Twin beds, bedside cabinets, Fitted Wardrobes. Pool: Heated in the winter,7 meters by 12 meters with poolside shower. 1st Floor: Bedroom 3 consists of a 6 foot bed, bedside cabinets, fitted wardrobes, chest of drawers and an air conditioning unit. En-suite : Bath with separate shower, 2 sinks, bidet & toilet. Large terrace leading from this bedroom, with table chairs and sunbeds. Views over garden, pool and sea views. Bedroom No 4: Twin beds, bedside cabinets, fitted wardrobes. En-suite with bath, hand held shower, bidet, two sinks and toilet. Bedroom No 5: Twin beds, bedside cabinets, fitted wardrobes. On entrance to these bedrooms is a small passageway, from this is another shower room, with sink and bidet. There is also another air conditioning unit to serve both these rooms. Also a good sized terrace with table & chairs. Views to mountains, pool and sea views. 2nd Floor : This leads to roof top terrace which is very spacious. There is an outside shower and sunbeds, also a table tennis table. From here you can enjoy the best views of the sunset behind the neighbouring isle of La Gomera Basement : Very large garage space, a seperate laundry room with washing machine and ironing facilities. There is also a safe in this room. Other rooms are for Staff use ie pool pump room and cleaners store & toilet. The pool and garden is maintained on a weekly basis. 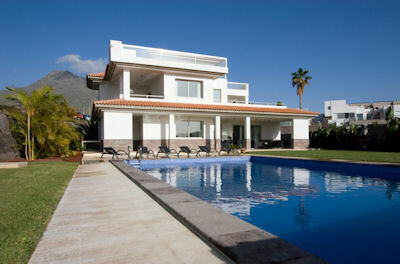 The villa is situated in the heart of the Del Duque area in Fañabe. Set in the centre of a new prestigous development of villas, it is within a few minutes walking distance (5 minutes at the most) of shops restaurants and the beach, everything you need to have a perfect holiday. Minimum 2 week rental over Xmas/New Year.